Hudson County Hosts Powerhouse Latina Music and Dance Acts in Concert Wednesday, July 18th at 7 pm. Tickets Available Now! 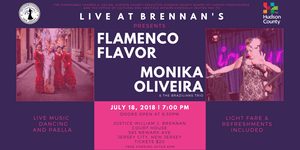 Jersey City, NJ—Hudson County Executive Tom DeGise and the Board of Chosen Freeholders are proud to announce an evening of dynamic live music headlined by two sizzling acts, to be presented Wednesday, July 18th from 7:00-9:00 pm in the Rotunda of the historic Brennan Court House (583 Newark Avenue, Jersey City). The evening will open with a performance by the Brazilian singer/songwriter Monika Oliveira. Born in Belem do Para and raised in Rio de Janeiro, Oliveira has been performing in the New York area for more than twenty years. She combines her love of Brazil’s musical heritage with a mastery of Jazz to create what critics describe as a “sultry variation on both … that is at once moving and rhythmic, pure and passionate.” Joined by the Brazilians Trio, she will take the stage at 7 pm.